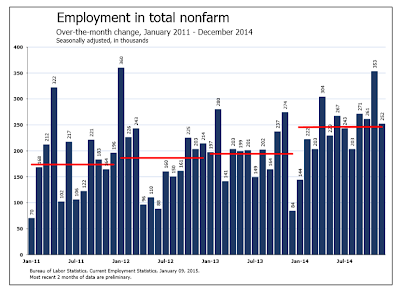 The big surprise in this month's report was a decline in average hourly earnings. Details below. For the second straight month there has been a huge discrepancy between the household survey employment and the establishment jobs survey. 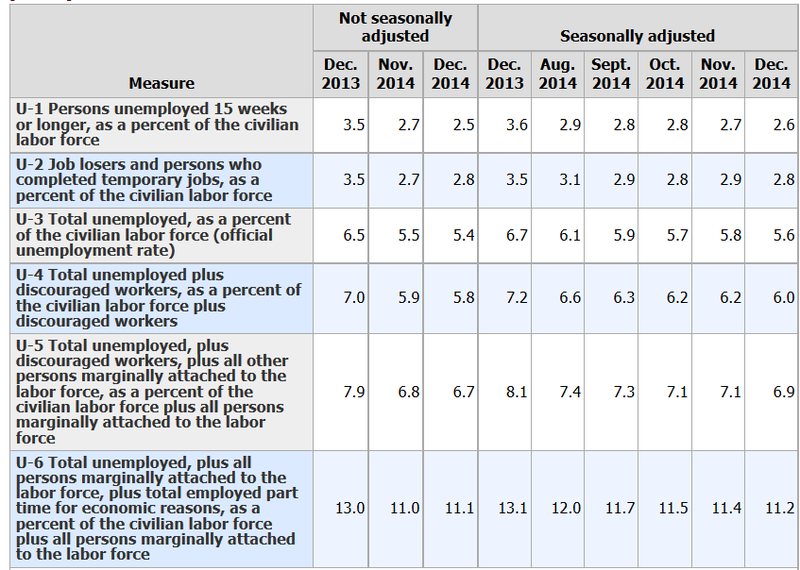 Swings in household survey employment and the labor force have been wild lately. Last month household survey employment rose by 4,000 while the payroll survey had job gains of 321,000 (revised up this month to 353,000). This month the household survey shows a modest gain in employment of 111,000 vs. a payroll survey of 252,000 jobs. 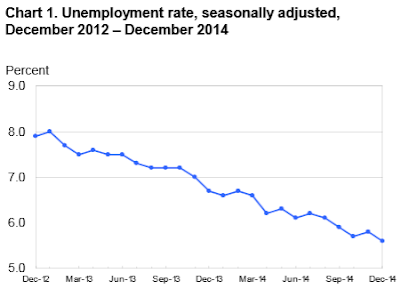 The unemployment rate dropped this month primarily because 273,000 people dropped out of the labor force. Once again we are in a situation where the establishment survey and the household survey are at odds. Over time these fluctuations tend to smooth out. The question, as always, is "in which direction". 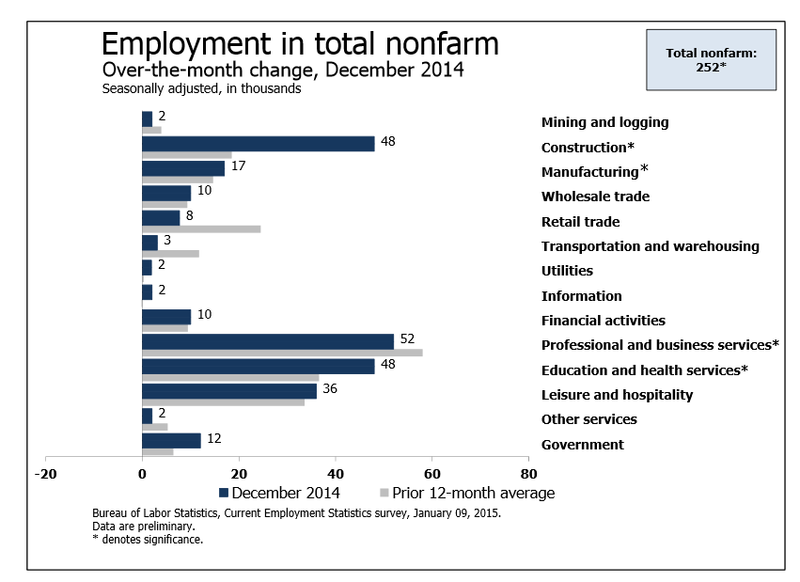 Please consider the Bureau of Labor Statistics (BLS) November 2014 Employment Report. Total nonfarm payroll employment rose by 252,000 in December, and the unemployment rate declined to 5.6 percent, the U.S. Bureau of Labor Statistics reported today. Job gains occurred in professional and business services, construction, food services and drinking places, health care, and manufacturing. Average weekly hours of all private employees was stationary at 34.6 hours. Average weekly hours of all private service-providing employees was flat at 33.4 hours. Average hourly earnings of production and non-supervisory private workers declined $0.06 to $20.68. Average hourly earnings of production and non-supervisory private service-providing employees also declined $0.06 to $20.47. For discussion of income distribution, please see What's "Really" Behind Gross Inequalities In Income Distribution? Starting January 2014, I dropped the Birth/Death Model charts from this report. For those who follow the numbers, I retain this caution: Do not subtract the reported Birth-Death number from the reported headline number. That approach is statistically invalid. Should anything interesting arise in the Birth/Death numbers, I will add the charts back. Notice I said "better" approximation not to be confused with "good" approximation. 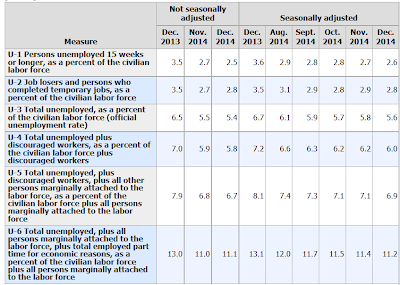 The official unemployment rate is 5.6%. However, if you start counting all the people who want a job but gave up, all the people with part-time jobs that want a full-time job, all the people who dropped off the unemployment rolls because their unemployment benefits ran out, etc., you get a closer picture of what the unemployment rate is. That number is in the last row labeled U-6. U-6 is much higher at 11.2%. Both numbers would be way higher still, were it not for millions dropping out of the labor force over the past few years.